A young man arrives in Paris in 1968, where a series of unlikely events lead him to a tiny village in Italy—and to the great love of his life. A marble merchant meets a couple on their honeymoon, introducing them to the sensual beauty of Carrara. An Italian woman travels to Canada on an odyssey to find the father she never knew. A terrible accident in a marble quarry changes the course of a young boy’s life and, ultimately, sets in motion each of these stories, which David Macfarlane masterfully chisels into a magnificent whole. Oliver Hughson falls in love with wild, bohemian Anna over the course of one glorious summer in Italy. Bound by a sense of responsibility to his adoptive parents, he leaves her and returns home—an act he will regret for the rest of his life. Through luck or fate, Oliver had found the woman with whom he was meant to be. And now he must try to find his way back to her. 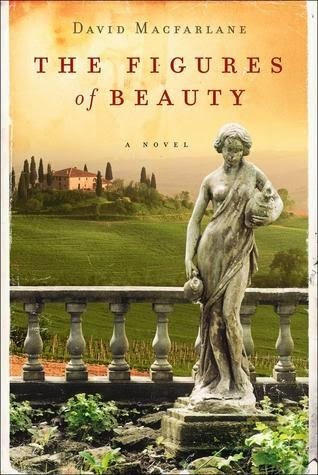 Narrated by the daughter Oliver never knew he had, The Figures of Beauty is a love story of mythic proportions that reminds us of the powerful bond that can connect two people indelibly across oceans and time. I received an advanced copy of this book from the publisher Harper via Edelweiss in exchange for an honest review. The expected publication date is October 7, 2014. I have so many thoughts running through my head that I am sure I will not be able to express them how I want but alas I will try. While this story is truly about what it advertises I feel that a huge part of it is missing in the synopsis provided. While it is essentially a love story it is also about art. Overwhelming about art to the point of being distracting. As someone who has an appreciation for art but not necessarily a deep love of it I have to admit I found it annoying. I was reading this on my kindle and by the time I reached the 30% mark I announced that if there was another mention of Michelangelo I would scream. By the 40% mark I was ready to throw the book and myself out of the window. The same goes for Carrara marble. I compare it to when the religious groups come knocking on your door to sell you the virtues of joining their belief system. While I believe I do not appreciate others forcing their belief systems on me. This may be harsh however this is how I felt. I also found the book to be overly descriptive of everything to the point that I found my mind drifting while reading. While beautiful words and passages can lift a book to another level I feel there is a fine line and that they can also distract from the true story. Lastly I found that the way the book traversed between the multiple stories confusing. While I love when there are multiple storylines that weave together I found that the transitions did not necessarily work. I often found myself re-reading passages to I could be clear which story I was reading and who was narrating it. While I am being very critical of this book I will pause to say that underneath there really is a beautiful story. I just felt that it was buried so deep below the rest that it was difficult to get to. While I necessarily didn't enjoy this read I can see how others will. Lovers of art (real lovers) will enjoy it. Those who enjoy great writing before plot. This is one of those stories that I feel will do great to a specific market niche and not necessarily to the masses. I am rating it a 3 star on that merit.